Johns Hopkins University Press, 9781421418322, 376pp. From the Arctic waters of Alaska to the southern tip of California, this fully illustrated guide captures the stunning diversity of fishes along the western coastlines of the United States and Canada. 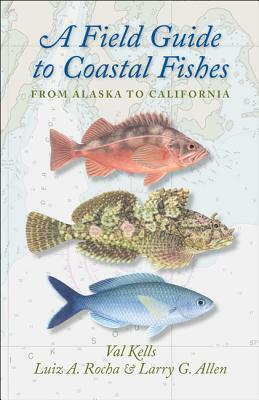 The combined work of renowned marine science illustrator Val Kells and distinguished ichthyologists Luiz A. Rocha and Larry G. Allen, A Field Guide to Coastal Fishes: From Alaska to California is this region's most current and thorough fish identification guide. Whether you are an angler, scuba diver, naturalist, student, or teacher, you will find every fish you're trying to identify, each shown in lifelike detail. The book's coverage extends from shallow, brackish waters to depths of about 200 meters. Poised to become your go-to reference, this guide will find a welcome spot on your boat, in your backpack, or on your bookshelf. Val Kells is a widely recognized marine science illustrator. She is the coauthor and illustrator of A Field Guide to Coastal Fishes: From Maine to Texas and the illustrator of Field Guide to Fishes of the Chesapeake Bay. She has illustrated numerous public aquarium exhibits. Luiz A. Rocha is an associate curator and the Follett Chair of Ichthyology at the California Academy of Sciences. He has authored or coauthored over seventy research papers and articles. Larry G. Allen is a professor and the chair of biology at California State University-Northridge and the president of the American Society of Ichthyologists and Herpetologists. He is the coauthor of The Ecology of Marine Fishes: California and Adjacent Waters.